Best View in Brooklyn: Detritus is the fancy word. Crap is the reality. Detritus is the fancy word. Crap is the reality. Today, my poetic inspiration comes from my morning walk down 5th Avenue along Green-Wood Cemetery. I guess the construction has brought out the litter-hooligans. The walkway has always been a slalom course of broken bottles and various leftovers from a passionate night. However, now there is a whole world of new trash to explore. Poo bags in clusters, pee bottles in pairs, lots of unidentifiable paper products and personal items. If I looked closely, I'm sure I could figure them out, but I'll leave that to someone with a stronger stomach. So I chose this poem because it talks about trash. Country trash. We have different trash here. We might not get bears who tear up our garbage bags, but we have feral cats, the occasional raccoon, and yes, even the elusive homo sapiens sometimes opens up bags in an artistic attempt to share what we feel is worthy to be thrown away. From watching Law & Order, I've learned that once you toss garbage out - onto the street for pick-up - it's fair game. So, there you go. Since this is all about trash, just be warned...there is a naughty word in this excerpt! So here is an excerpt from William Matthews' "The Bear at the Dump." 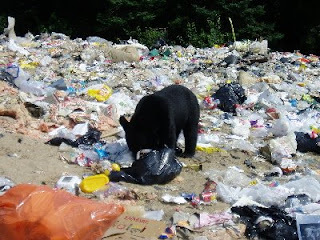 from "The Bear at the Dump"
where the town paid to contain it. folks like you don't get to see this often,"
one year-round resident accused me.